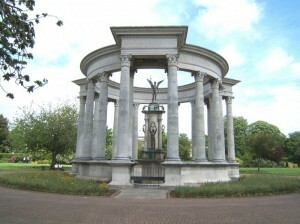 The Welsh National War Memorial was erected in Cathays Park in 1928. This image is one of many photographs of war memorials now available on Coflein. Between 2014 and 2018, the Royal Commission will take part in the centenary commemoration of the First World War. The conflict, beginning in 1914 and ending in 1918, as well as its immediate aftermath, shaped the Wales of today. One hundred years on, organisations across the nation are working to promote understanding of the conflict and the devastation it wrought, explore its impacts, and discover its legacy for modern Wales. Working in partnership with Cadw, English Heritage, Historic Scotland and the Council for British Archaeology on the Home Front Legacy 1914-18 project. This unique, UK-wide community project records physical remains of sites and buildings associated with the First World War, ensuring their history, heritage and stories are recorded for future generations. (www.homefrontlegacy.org.uk). Taking opportunities to work in partnership with other organisations to commemorate the events of the First World War, and explore its impact and legacy for the people of Wales. You can follow our work on the First World War by subscribing to our blog, www.heritageofwalesnews.blogspot.com and following us on Twitter at @RCAHMWales, and #walesremembers. The Royal Commission on the Ancient and Historical Monuments of Wales is the investigation body and national archive for the historic environment of Wales. It has the lead role in ensuring that Wales’s archaeological, built and maritime heritage is authoritatively recorded, and seeks to promote the understanding and appreciation of this heritage nationally and internationally.